LEN - www.lankaenews.com | Why others also should be appointed, not only doctors to the Medical Council ? (Lanka e News 26.Aug.2018, 4.00AM) Following the criticism leveled by Prof. Colvin Gunaratne that the SL Medical council (SLMC) is a place ‘Horage ammagen pena ahana thenak” ( the place where rogue’s mother is asked to reveal by ‘light foretelling’) when tendering his resignation from it , heated discussions have been triggered among society in regard to the Council’s composition. The views expressed by J.C. Weliamuna P.C who has long experience pertaining to human rights and anti corruption activities seem to be most independent , prudent and appropriate vis a vis the present time. The views of Weliamuna are hereunder …. ''The medical ordinance came into being in 1927, that is 90 years ago. This was amended from time to time. It is in 1987, the present image of the Medical Council came into existence . The powers to regulate in relation to discipline in the medical profession , and other professional bodies like the medical services affiliated to the medical profession are also vested in the Medical council. The SLMC is constituted of a president appointed by the minister, and representatives of every medical faculty. They are the deans of those faculties. Another 8 members are appointed through the ballot which includes a registered medical practitioner and a Dental doctor . The minister too appoints 4 more members. Two of them should cannot have connections with the government .Though the Director General health service , Director General Teaching hospitals and the president are appointed by the minister , the Vice president is selected by the Council itself. According to the 13 th amendment of the ordinance , all the members of the Medical Council should be doctors. The principal task of the SLMC is regulatory. In any profession if any Institution is regulating any body ,the key requirement is, that regulatory Institution has to be independent.That is it must be independent of those whom it is regulating. Similarly the regulating Institution should be independent of the government too. Moreover a regulatory is necessary not only from the standpoint of the professionals. The General Medical council (GMC) of England which is the Sri Lankan counterpart was launched in 2001 as a registered charitable Institution. That country’s medical profession is regulated by that body .In 2001 another ‘Council for Healthcare regulatory excellence’ was commenced. The appeals made against decisions of the GMC could be taken up by that Institution. The GMC which comprises 12 members has six medical professionals while the other six members belong to other professions. There are also other councils too in England which regulate other health services such as the Optical Council and General pharmaceutical Council. 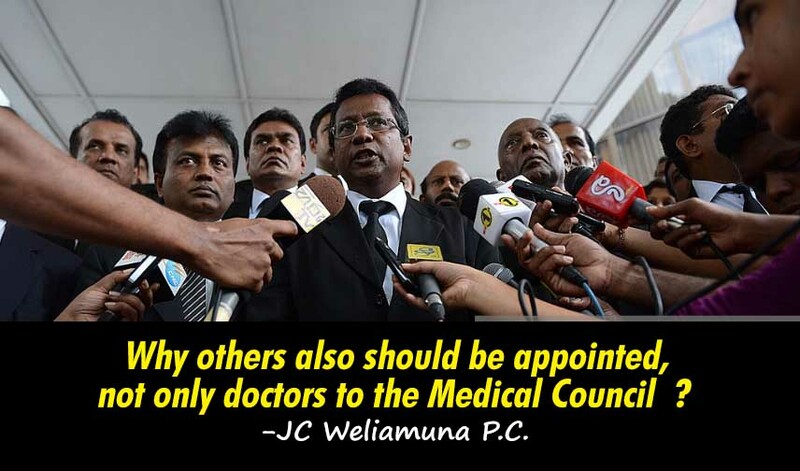 The contention that the medical council composition must change was propelled forward again simultaneously with what was revealed by the SLMC president Colvin Gunaratne when he was going to resign. He said ‘ meka Horage ammagen pena ahana thenak” ( the place where rogue’s mother is asked to reveal by ‘light foretelling’). In the past a proposal was made to amend the medical ordinance . Another health professional trade union challenged that draft in the supreme court (SC) about two to three weeks ago Various grounds were cited regarding the composition of the Medical council .The issue that sprang up was , how is that other professionals are coming under the SLMC? Currently the Medical council is administered by the GMOA. According to Dr. Gunaratne , when 8 doctors were being elected by the ballot , bus loads of doctors were brought like voters during a general election . Besides the GMOA today is less a trade union and more a group serving a political party , dancing and prancing according to their agendas. Like how GMOA is not an independent trade union , it is the GMOA which is a big stumbling block to the Medical Council militating against its independence . During the entire recent past GMOA has been disparaging and discrediting the professionals of other health services. They are grabbing the studying opportunities and career opportunities by force. Besides they are exerting pressures to sabotage the academic courses. In the circumstances , it is a pertinent question , how can a medical council that is under such a group regulate the other professionals ?